Powering the Future: What will fuel the next thousand years? When you hear the term nuclear energy, images of Fukushima or Three Mile Island may come to mind. But harnessing nuclear power isn't limited to the reactors that we currently use, which rely on nuclear fission. Energy can also be harnessed from fusion. "Nuclear fusion is the energy that powers the sun and stars," Mike Mauel, professor of applied physics at Columbia University, told CBSNews.com. "It takes hydrogen gas, heating up to millions of degrees, and brings the atoms together to release energy and make helium." Instead of splitting an atom's nucleus, like in fission, nuclear fusion is the process of bringing together two atomic nuclei to form a new nucleus. And there is no need for dangerous chemical elements like uranium or plutonium -- easing the fears of nuclear proliferation. Energy derived from fusion is appealing because very few natural resources are required to create fuel. "The fuel for fusion basically comes from sea water. Every bottle of water that we drink has heavy water -- deuterium -- inside. Enough that's equivalent to a whole barrel of oil," Mauel says. According to the U.S. Energy Information Administration (EIA), approximately 68 percent of the country's electricity in 2011 was generated by coal, natural gas, petroleum and oil. The next highest energy source was nuclear energy at about 20 percent. About 13 percent was contributed by renewable sources, like solar, hydropower, wind, geothermal and biomass. A United Nations panel of scientists has reportedly agreed, with near certainty, that humans have a direct influence on climate change. The organization is expected to release its findings in an upcoming annual report. "It is extremely likely that human influence on climate caused more than half of the observed increase in global average surface temperature from 1951 to 2010," says a draft of the report, obtained by the New York Times. "There is high confidence that this has warmed the ocean, melted snow and ice, raised global mean sea level and changed some climate extremes in the second half of the 20th century." carbon dioxide in the air could rise to 400 parts per million(ppm) -- it's currently just over 390 ppm. According to the Scripps Institution of Oceanography at the University of California, San Diego, CO2 levels hadn't surpassed 300 ppm in 800,000 years. solar , wind, biomass and nuclear technology. Scientists believe that energy created from nuclear fusion is not only inevitable, but the only option that makes sense as a long-term solution. "Many people who work in fusion power look 50 to 100 years in to the future, and we say 'what else can provide sustainable clean energy source for thousands of years on a large scale,' and fusion's one of the only ways to do that," Mauel says. "I think that advances that we're making in solar power, wind power, clean coal technology, nuclear power -- all that is going to help us get through the next 50 years. But after that, we have to have fusion power." In France, the International Thermonuclear Experimental Reactor (ITER) is the world's largest science experiment, and aims to prove that fusion can be achieved on a mass scale. The European Union, United States, China, South Korea, Japan, India and Russia have agreed to invest in building a reactor that can conduct experiments in burning plasma. 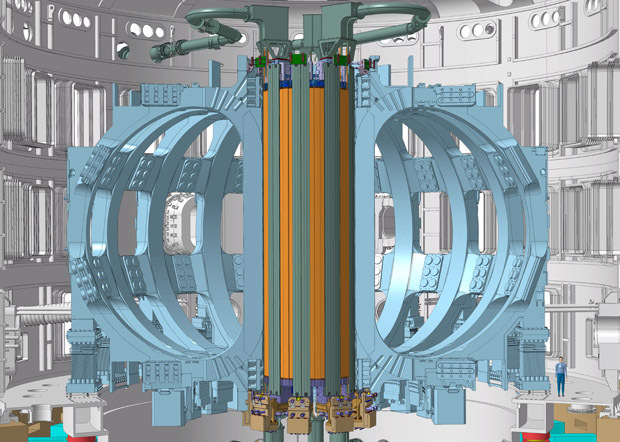 "ITER solves the technical problems," Dr. Ned Sauthoff, director of the U.S. ITER Project, told CBSNews.com. "Then industries in each country decide whether it will build reactors." Sauthoff says that we know fusion has been done, but not in a large enough quantity to provide electricity on a mass scale. It is estimated that ITER will produce 500 megawatts of power for about 50 megawatts put in. Progress doesn't come cheap. In the United States, Sauthoff says it could cost $10 billion to build the first fusion reactor. "There are a lot of cost reductions that will come in the future," Sauthoff says. "Right we have an R&D system with lots of knobs and lots of dials. And that's expensive." Mauel believes that while it's important to continue investing in renewable energy in the interim, it's only a matter of time before fusion energy will be a viable option for producing electricity. "The fusion power will be ready in the second half of this century, and I think that's when we're going to need it most," Mauel says. It had withstood a war, a revolution and neglect, as well as the impact of 30,000-40,000 tourists a day. But there was so much more than stone to Notre Dame Cathedral. David Turecamo reports on the heritage of the Paris landmark that was damaged by fire this week, and about the life within its walls.